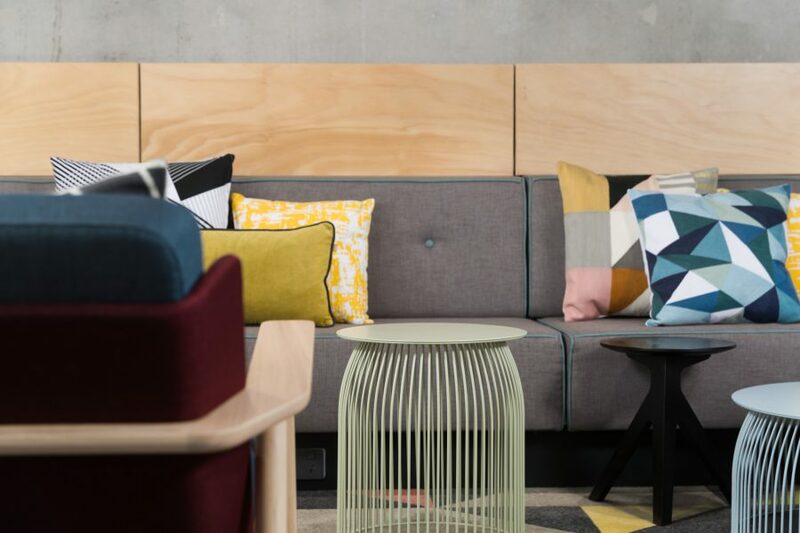 Urban, industrial, and with design at its core, the brand new Atura Adelaide Airport hotel has officially opened its doors, offering business and leisure travellers comfort and convenience, without sacrificing stylish design. Characterised by its modern atmosphere and free-flowing communal spaces, the highly-anticipated seven-storey hotel will undoubtedly become a destination for those precious moments of hello and goodbye. Renowned architect and interior designer, Nic Graham, has designed the Lobby, restaurant Hangar Bar & Grill, Meeting Point Café and the 165 spacious and contemporary guest rooms. The large scale lobby offers a sanctuary for travellers looking to escape the bustling terminal. Tall ceilings and large windows flood the room with natural light with communal tables, quiet zones and a pool table bringing visitors and hotel guests together. Hangar Bar & Grill is open for breakfast, lunch and dinner and is led by Adelaide-born Executive Chef, Thomas Bator. The menu features authentic pizzas, tender rib-eye steaks and fresh salads packed with flavour. The open-plan bar adds to the relaxed atmosphere where travellers can unwind for a moment with a cocktail, wine or beer, before their journey beyond. The public areas are accessible to all travellers with the seamless integration of the hotel and airport plaza via a direct walkway. The hotel features a range of spacious and contemporary guest rooms, some with city views and for those who appreciate aviation, the Runway Rooms give unparalleled views of the airport runway. Guest rooms have been designed around the comfortable EVENT dream beds and a multipurpose work zone featuring a lounge, desk and 49 inch LCD TV. All the modern comforts have not been forgotten with full mini-bars, room service, complimentary Wi-Fi and complimentary gym access. Meetings and conferences will never be the same with eight flexible event spaces and a capacity to cater up to 320 guests. Catering menus are carefully curated with a creative flair to suit any event, while flexible walls and soundproofing allow for a seamless set-up. 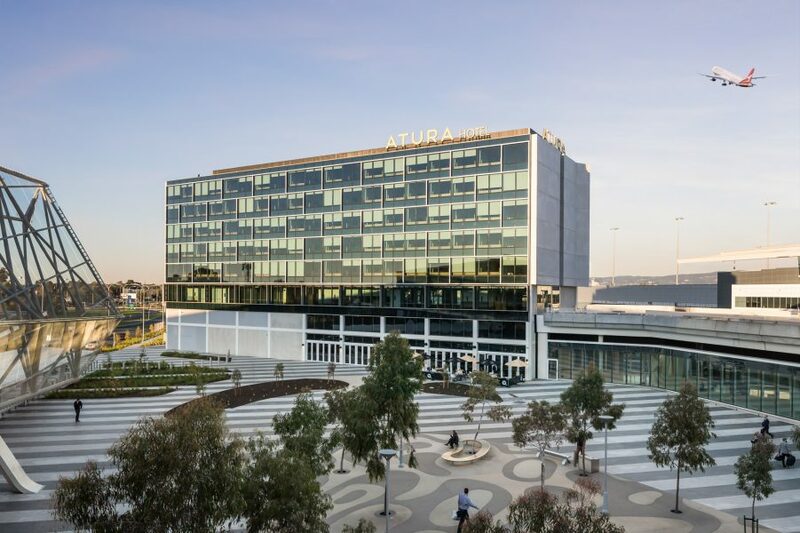 Event Hospitality and Entertainment’s Director of Hotels, Norman Arundel, said Adelaide is the first Australian airport to welcome the Atura Hotel brand with the project estimated to have created 350 construction jobs and 65 roles within the hotel. Other Atura hotels are trading successfully in Albury, Blacktown and Dandenong with additional locations in the pipeline. 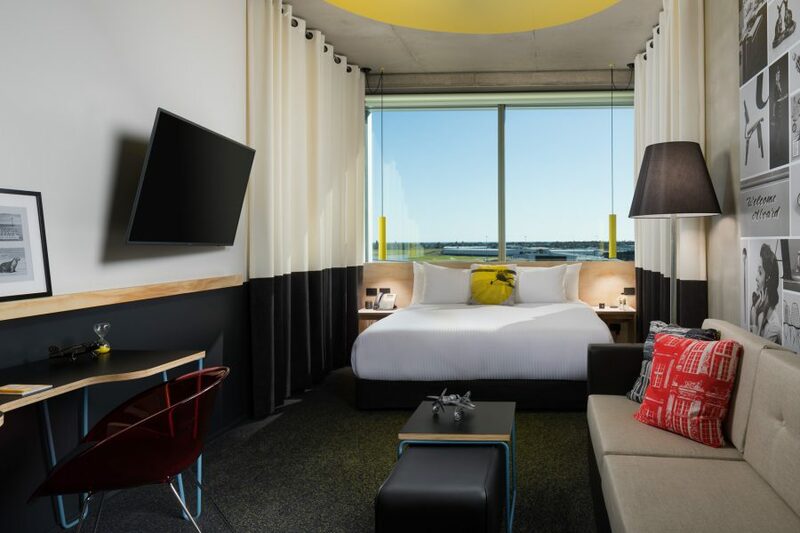 Adelaide Airport Managing Director, Mark Young, said the hotel has become the first in Australia to directly link with the main domestic and international terminal of a capital city airport. “We believe the Atura Adelaide Airport Hotel offers a real point of difference to the airport precinct. Guests will be able to walk straight between the hotel and the check-in and arrivals halls,” Young said. “More than 8 million people fly in and out of Adelaide Airport each year. Our customers have told us they’re delighted they can now have the convenience of staying overnight to catch early morning flights after meetings or conferences. “The hotel will be a focal point of our long term vision to create an easy, seamless connection between our aeronautical activities and our planned Airport Business District.